After 30 years at the helm that kept the company No. 1 in auto insurance, State Farm CEO Edward Rust Jr. announced Thursday he will yield the seat to Chief Operating Officer Michael Tipsord in September. Since Rust took over in 1985, the company grew from $10 billion to $80 billion and from 45 million policies to 82 million. 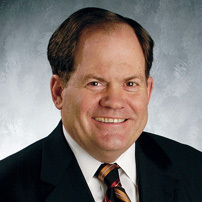 Tipsord has worked at State Farm since 1988, becoming chief financial officer in 2004. For collision repairers, Rust’s tenure brought the explosion of State Farm’s Select Service direct repair program and U.S. rise of PartsTrader by mandating the procurement system for all Select Service shops. Rust, who will remain chairman of the board, also leaves the CEO office amid a fleet of lawsuits by collision repairers alleging State Farm manipulated data to achieve its desired labor rates and helped major insurers work together to drive down those rates. It also saw the $1 billion judgement against the company — ultimately reversed in another controversy — in the “like kind and quality” Hale v. State Farm case, discussed here in a lengthy Center for American Progress analysis. The new boss might not be much different from the old boss for the auto body industry. Tipsord was the company’s president, and he held “C-level” leadership roles during the expansion of many of the policies that’ve been so controversial for collision repairers.